Eucharistic Adoration Every Month on 1st Friday. Do you know that Jesus waits for you? Our Parish has 24 hour Eucharistic Adoration every month on 1st Friday and Saturday. Adoration begins after Friday morning Mass and ends at 11:00PM. We are always in need of additional volunteers to spend an hour with Jesus in the Blessed Sacrament. 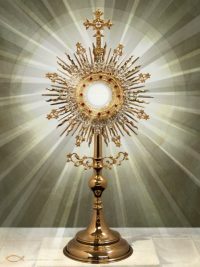 For January, February & March Adoration will be on the 1st Friday after 8:30 am Mass until 11:00 pm.